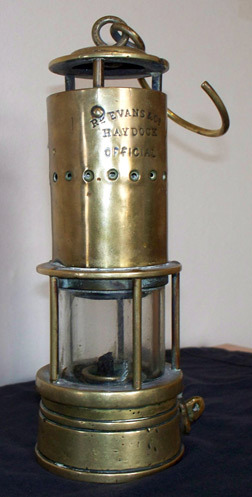 Mick Reed - Wolf Safety Lamp, what is the brass clip fixed into the base for? Anthony - Are The GR6's Deputy’s Lamps? I have an old Davy Lamp that is twice as large as a standard one. Does this have a different name to enable me to find more about it. 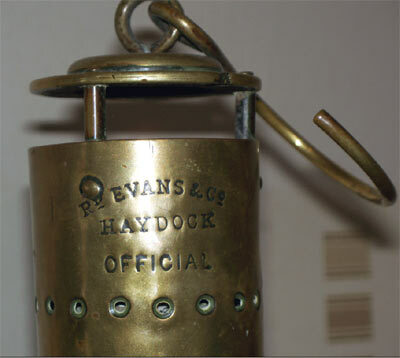 Old Davy Lamp, From Silverwood In South York's, Which Is 100% Bigger Than The Standard Lamp Size, Why So Big? Hi, it's been 3 years from when I put my question forward but no replies. I have an old Davy lamp which is 100% bigger than the standard lamp size. As I've never seen another one of this size I presume it to be rare. Does anyone know of any others and if so what was the purpose of it compared to the standard sized ones? This originally came from Silverwood in South York's. Wolf Safety Lamp, what is the brass clip fixed into the base for? I’ve attached a picture of the base of a wolf safety lamp that I am thinking of purchasing. Right in the centre of the picture you can just make out the head of the adjuster for the wick. Just up from that on the picture you can see that there is some sort of brass clip fixed into the base. Have you any idea what this is for? (If you were to look into the main housing of the lamp, you would see that there is a mechanism that comes up right at the side of the wick pipe. I don’t know what the mechanism is for; perhaps it is some sort of flint lighter?) It may be coincidence, but the clip on the base is directly underneath this mechanism. Indeed this is the device to light the lamp. 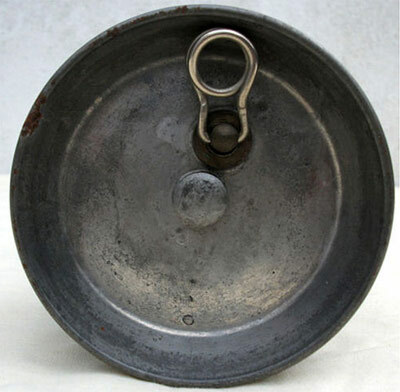 Pull the ring down towards the floor, its on a hinge effect, and turn briskly clockwise half to a full turn. This has a very clever spring loaded internal portion that then increases the number of turns, strikes on the flint (hopefully one in there) and thus lights the lamp. The 7RMBS was the last full size lamp that WM Maurice of Sheffield made, quite a large, heavy beast. Hello and many thanks for running your website, its been so helpful and informative. I have my grandfathers miners lamp. I belive its a deputy's re-lighter lamp - I know he was a deputy and the lamp has a flint and internal lighting mechanism (for want of the correct terminology). 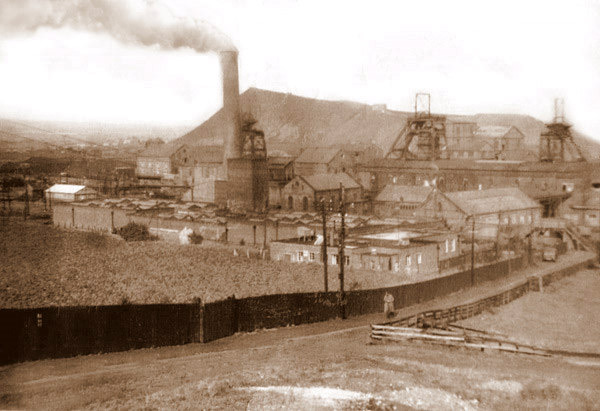 He worked in the mines in County Durham, specifically Ferryhill (Mainsforth Dean and Chapter). I have manged to light the lamp (after at least 50 years of not being used! ), but getting a spark isn't easy and seems to happen more by luck then design. Are there any tips, or anything else I can try? THE PROTECTOR LAMP & LIGHTING Co LTD. I've recently been given a lamp and would like to know a little more about it. I hope you can shed some light on it for me. On the lower brass band of the top section are the numbers... 8 then a gap and 55. Are The GR6's Deputy’s Lamps? Hello, I have just inherited a safety lamp which was the property of my father-in -law,a mine manager who died 26 years ago. The lamp was then kept by my mother-in-law who has just recently died. I would like to clean the burner up and see if it will light but cannot work out how to get the bottom part open. The base is heavy brass with a swivel lock on the side which I cannot budge. Does the bottom unscrew? The details on the lamp are: - The Protector lamp and Lighting Co. Ltd. Type SL. Ministry of Power Safety Lamps approval No.B/120. Makers Eccles. My name is Brian Lancaster I live in Wigan and my late Father worked at Wood Pit till it was shut down and then he went to Parkside. May be you could forward this to Ian Winstanley as I don’t know how to contact him. I have attached a couple of pics of the lamp.